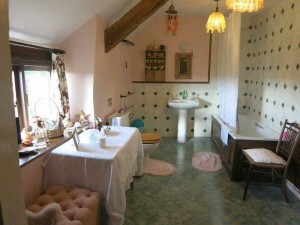 Named and coloured after the ‘Pink Campions’ growing in the hedgerows, this popular double bedded bedroom, overlooks the pretty courtyard garden. Situated on the first floor in the old part of the 1520 farmhouse, this bedroom with its large private bathroom (toilet, basin and bath with shower) across the landing, has lots of character with beams and sloping floors! 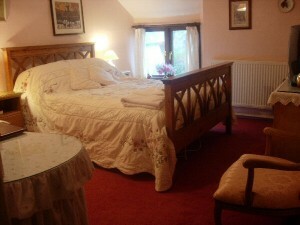 This popular bedroom has; a comfortable wooden double bed, with soft fresh linen, fluffy white towels, abundant toiletries, hair dyer, well stocked tea and coffee tray including Devon fudge, radio alarm clock, digital TV with DVD player and free Wi-Fi. Medieval, 16th Century farmhouse at Huxtable Farm, offering quality B&B accommodation near West Buckland, Barnstaple, Devon EX32 0SR. Situated on a Jacob sheep farm, with Devon Wildlife Trail & panoramic views, in beautiful Devon countryside, between Barnstaple, South Molton & Exmoor National Park.